Why did you pick our company? : Our group of six checked various websites, and talked to friends who had done similar trips. None of our friends had traveled with GCW, but the companies they used were either no longer in business or provided little information on their website. The GCW website provided us with a lot of detailed information about the trip that made us feel comfortable we knew what we were getting into. Was there any additional info you wish you had known before your trip? (transportation, packing, on-river): We wish you had told us at the time we made our reservation that we should also reserve mules at the same time. We contacted the NPS about using mules for our backpacks about six months before the trip and found out they’d been sold out for months already. If we’d known to do it as early as possible, we would have. Although, I thought it was fine carrying my 24-lb pack, some in my group found it difficult. Part of our daily commitment is to protect and conserve the resources, was that concern evident and did you feel we educated others to do the same? : Yes it was very evident. Were the river guides friendly, helpful and concerned about your needs? : Extremely so. 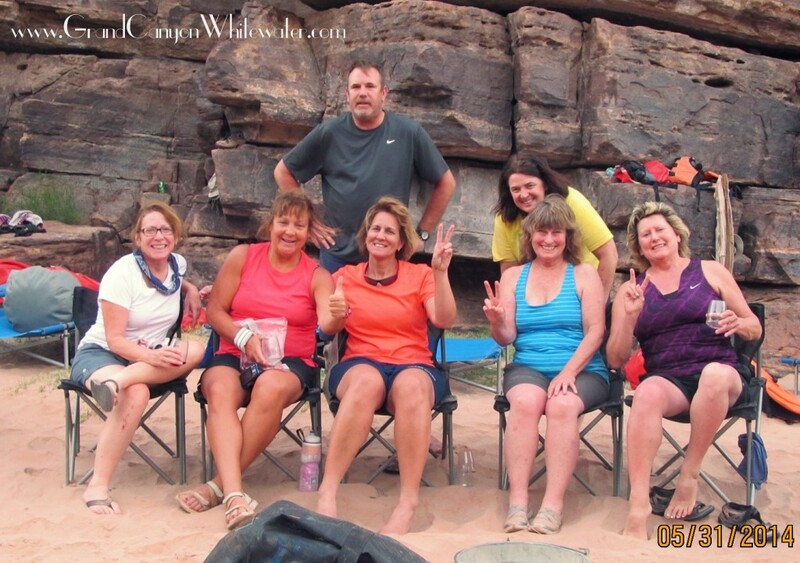 Were the river guides knowledgeable and willing to share their knowledge about the canyon? : Very much so. What was your favorite meal? : The french toast and bacon, coming in a close second was the rib eye steak and potatoes. Additional Comments? We had a really fun group. Everyone ate dinner together and really got along all through the day. We really enjoyed Ted (one of the guides) playing guitar for us in the slot canyon. Who gets a mini-concert in a slot canyon at the Grand Canyon? We saw some of the most beautiful sights any of our group of six gals had ever seen. Sleeping under the stars, and actually seeing the constellations, and even the Milky Way, impossible to describe. I’ve already recommended the trip to several people who’ve asked me about the trip (I just got back yesterday! ).